Your health is important from your head to your toes. We’re committed to helping our patients have a full healthy head of hair. That’s why we offer the best permanent solution to hair loss and thinning hair that you can find anywhere. It’s called the ARTAS® System and it uses robotic technology to give you a virtually pain free hair transplant. The most common issue related to exercise and hair loss is stress. In general, exercise is beneficial. According to the lifestyle magazine InMotion Life, it can help you to lose weight, combat chronic health conditions like diabetes, boost energy and help you sleep better. It can also help you improve your mood which certainly reduces stress. But the magazine also warns that you can have too much of a good thing and there’s a downside to too much exercise. According to LiveStrong.com, excessive exercise over a long period of time puts the body into a state of chronic stress. And stress can lead to hair loss. According to InMotion Life, a good rule of thumb is not to exercise more than one hour on a daily basis, if it’s stressing you out. According to the American Hair Loss Association, telogen effluvium is a condition in which a significant amount of hair goes into a resting phase causing hair to shed. A lot isn’t known about the causes of this condition and it’s believed that shock or stress causes it to occur. There aren’t a lot of known cures for telogen effluvium but if it’s caused by stress it’s a good idea to put yourself in less stressful situations. Hair loss from stress does usually grow back but it could take several months. It’s believed that alopecia areata, an autoimmune deficiency that causes your scalp, face and other parts of your body to lose hair, might be partially caused by stress. Hair loss from this condition is usually not permanent either. Trichotillomania is a condition in which patients feel compelled to pull out hair from their scalp and from other areas of their body. This can be a permanent condition especially if it occurs over a long period of time. 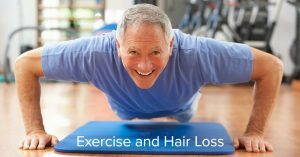 If stress related hair loss is caused by over exertion, it’s a good idea to cut back on your exercise program. The good news is that in most cases, getting rid of stress will allow hair to grow back. But if you have permanent hair loss for any reason, RHRLI can help. We’re the only hair loss treatment center on Long Island that has the ARTAS® System. Contact us today. Previous Post: « How Long Do Hair Transplants Last?